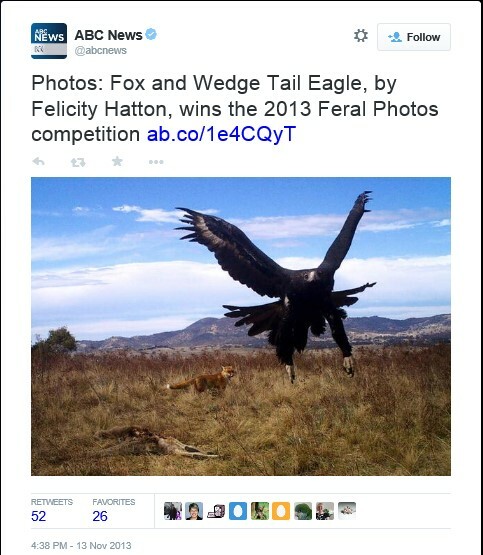 2014 was a big act to follow, with the late-2013 publication by an honours student of this outrageous moment when a fox and eagle crossed paths on one of Canberra’s hills. 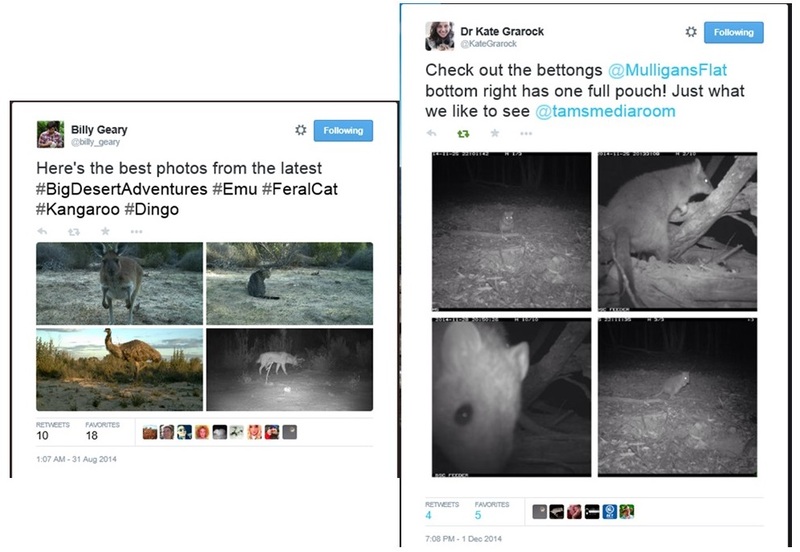 For breadth and quality of mammal interactions in remote locations, one can’t go past Guy Ballard’s @DingoResearch feed. 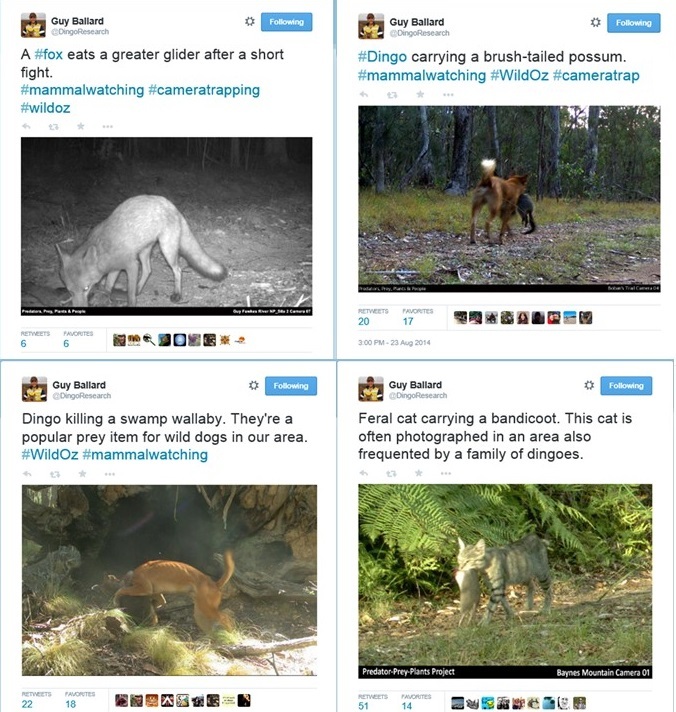 Four images alone – foxes eating a Greater Glider and a Possum, a feral cat taking a bandicoot home, and a dingo shaking down a swamp wallaby say a great deal about the food-webs and ecological interactions in our forests. Look-away now school-kids, these ecological interactions are not for the faint-hearted. 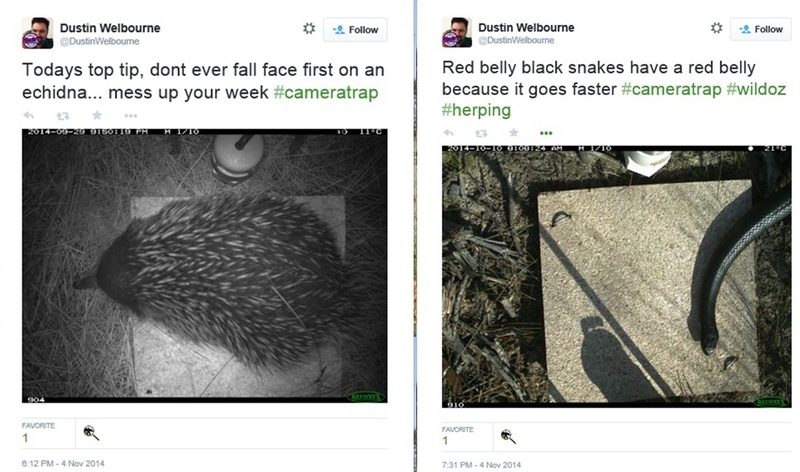 Some folks have added a touch of cartoon to their camera trap images, to make them especially engaging. Wombat on Patrol is routinely entertaining, commentating the night-time antics of one of our least-appreciated Australian fauna. 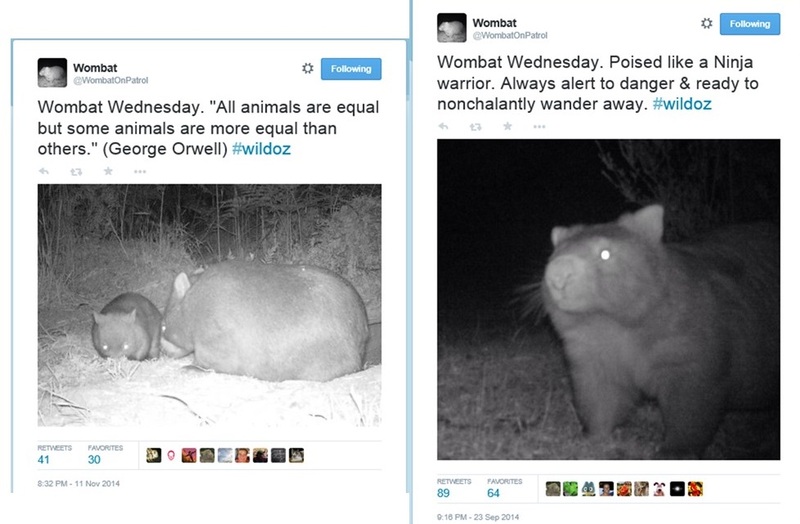 With the humour of the dry Antarctic, the highland wombats and their exploits reach far and wide, like Orwellian Ninjas. 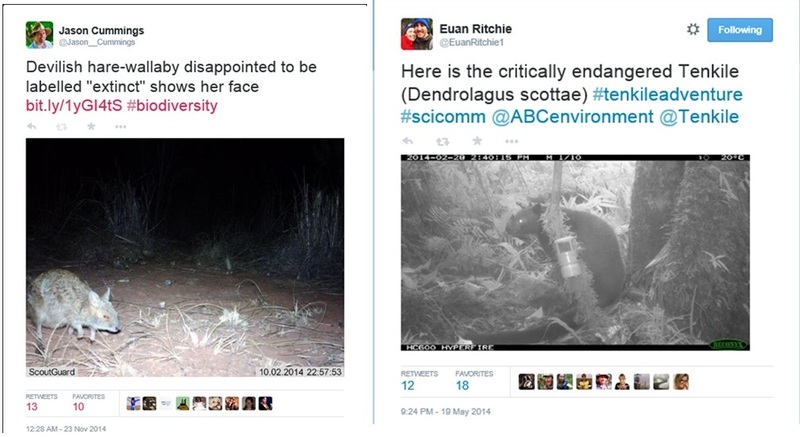 On the serious side, I was fortunate enough to see Dustin Welbourne’s talk at the Ecological Society of Australia conference in Alice last year, and enjoyed his presentation examining the efficacy of camera trapping compared to traditional fauna survey techniques. His images don’t seem to attract the reach of others, yet, but he is certainly capturing a wide array of fauna in a small area. 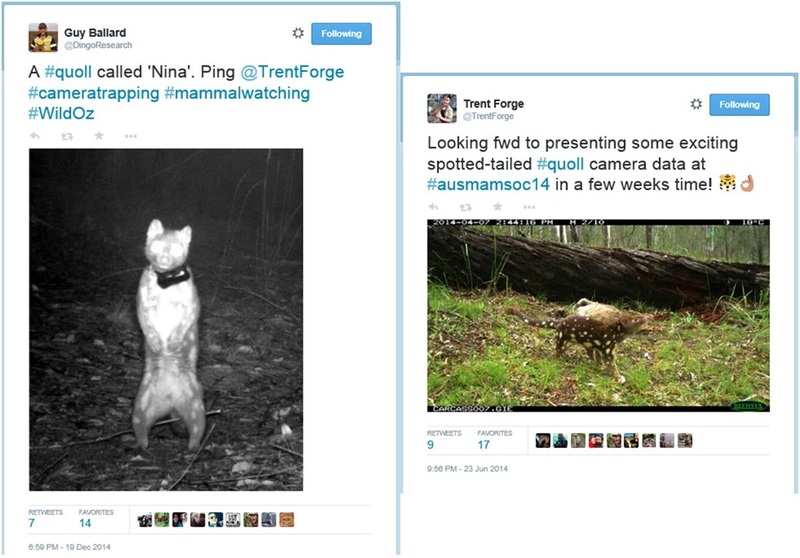 Many of the camera trappers are #mammalwatching, and I was surprised, with my cursory survey, to find few riparian or aquatic or marine examples. Probably those folk are just moving in different circles and I don’t come across them. However, on the avian front, the Swift Parrot team are doing a great job bringing us imagery of interactions in the canopy, from the endangered and the routine. 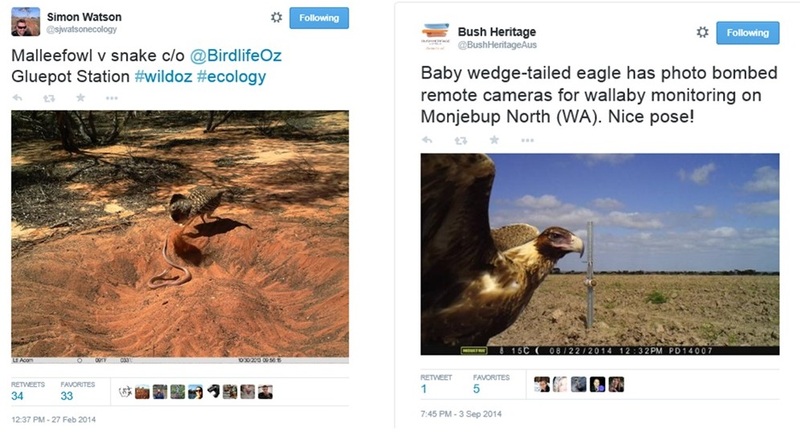 A couple of non-for-profit organisations also made telling contributions – with this near-famous bust-up between a Malleefowl and brown snake courtesy of Birdlife Australia and an eagle-selfie from Bush Heritage Australia. Compilation images are always a treat when served up, and Billy Geary earnt his keep last year scouring thousands of images, to present a concise compendium of big desert fauna. With a single-species you can also do wonders to present a snap-shot of behaviour, up close and in the dark, like Kate Grarock’s bettong collage from the population at Mulligans Flat. 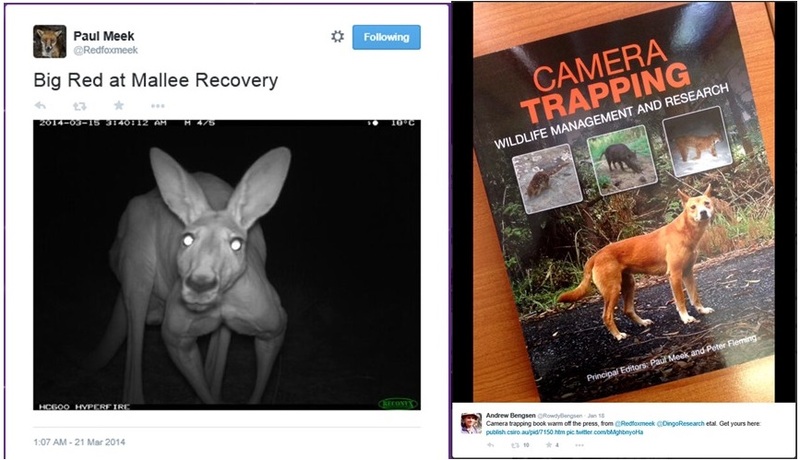 And the encouragement award for 2014 goes to @Redfoxmeek for his Big Red Kangaroo – at least he went on to publish a text book on the topic! 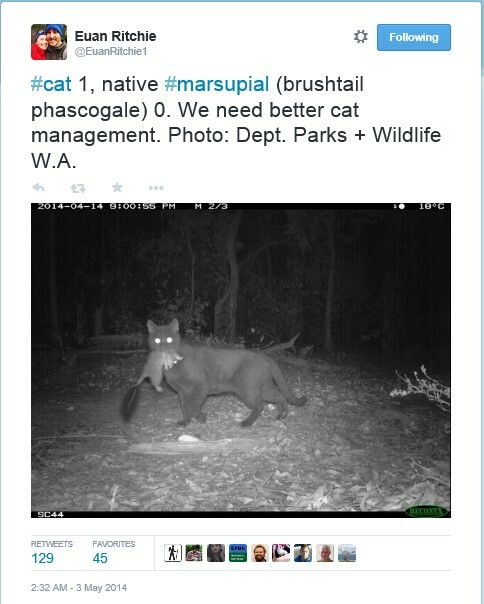 C’mon State Government ecologists, we know you are sitting on a plethora of cool stuff – start sharing to promote caring!!! Great images of ecological interactions, those that tell a story in a single moment, are dynamite for communicating broadly with immediate impact.